A drawing by notorious criminal Charles Bronson which had been put on display on the Tube has been removed. 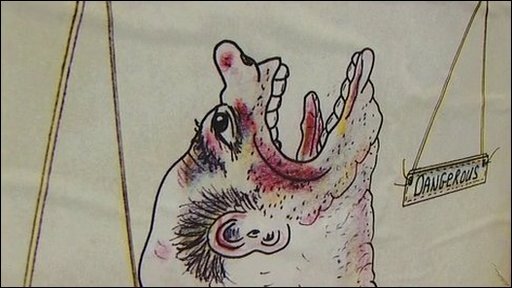 The drawing, which depicts a head with three faces poking out of a straitjacket, went on display at Angel station in north London on Monday. The National Victims' Association said it was "depressed" the work was put up. It is not clear how it had been removed as London Underground did not order its removal, and police said no theft or acts of vandalism had been reported. Benjamin Moore, from Art Below, which pays a company called CBS to display art on the Tube, said he was "disappointed" it has been removed. A London Underground spokesman said it was looking into how the artwork was removed and a British Transport Police spokesman said no crime in relation to the drawing had been reported. Bronson, 58, was jailed for armed robbery in 1974. He has committed a string of crimes behind bars, including hostage-taking, and rooftop protests and has spent much of his time in jail in solitary confinement. Mr Moore came into contact with Bronson through mutual friend Tom Hardy, who played the criminal in the 2009 film Bronson, which is based loosely on the prisoner's life. He received a letter from Bronson saying he would like his work displayed on the network. The artwork was due to be displayed at the station for two weeks. "There's a lot of madness and sadness in his work but what struck me was the humour," Mr Moore said. 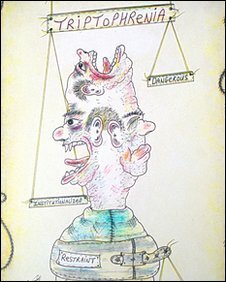 He says he thinks Bronson's artwork is unique because of the amount of time he has spent in confinement. But the National Victims' Association (NVA), which supports victims and families affected by crime, had criticised display of the artwork. "I would say that the overwhelming majority of victims of crime will be astonished and thoroughly depressed that one of the most violent criminals in the prison system is allowed to engage with the British public in this way," a spokesman said. Bronson, born Michael Peterson in Luton, Bedfordshire, changed his name in the 1980s while working as a bare-knuckle fighter.